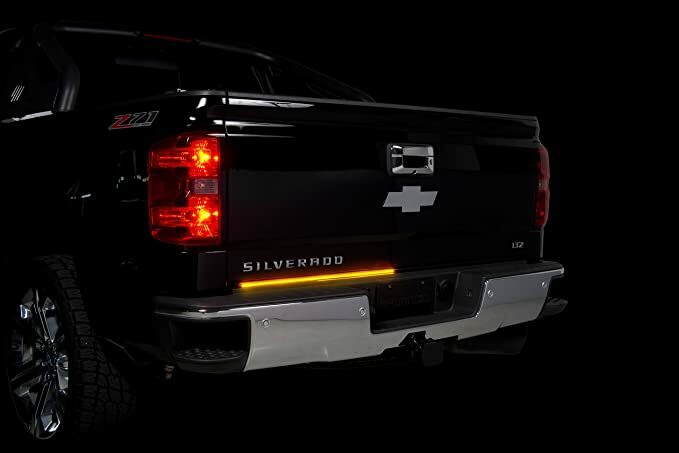 When you add a truck led tailgate light bar onto your tailgate, it will be a great addition to your vehicle. 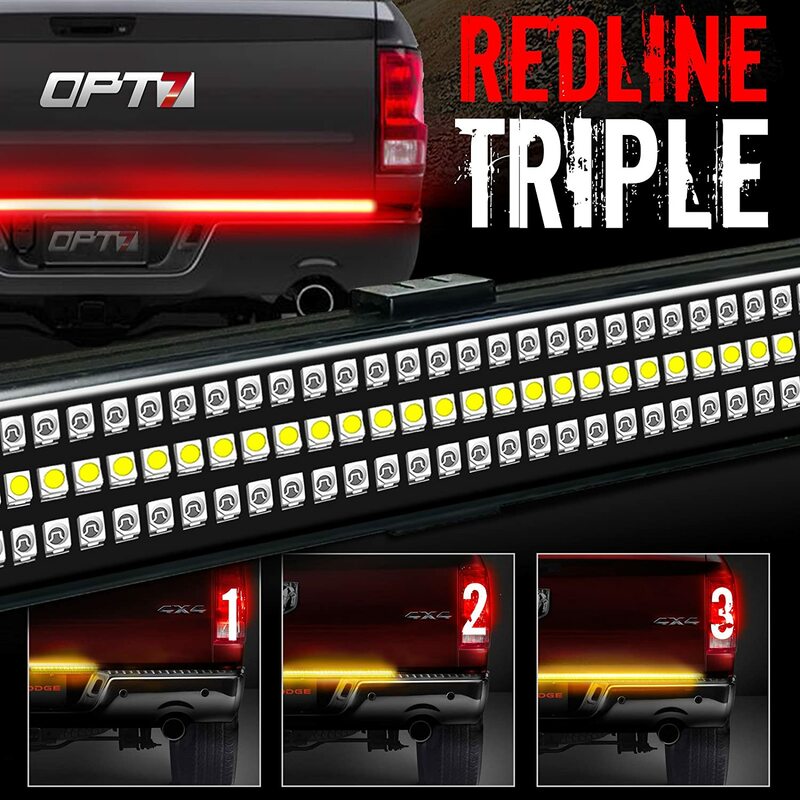 It will provide additional lightening which can serve as brake lighting, running lights, turn signal or reverse lights and that is why you need to choose the best truck led tailgate light bar that your budget will allow you to buy. It needs to be easy to install by use of adhesive tape on the back which then allows you to simply peel and stick the light bar onto your tailgate. Some come with a plug and play connector which then attaches to your trailer plug. 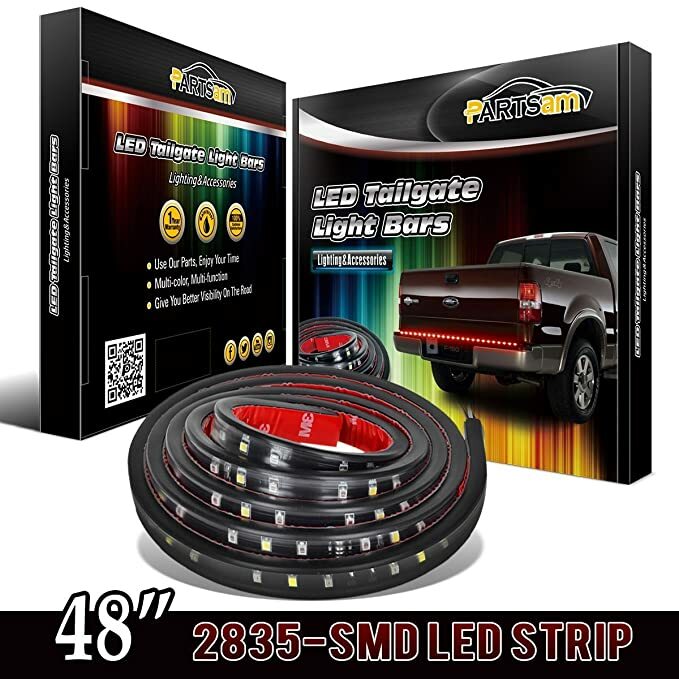 When you are out shopping for a light bar for your tailgate, you will need to determine beforehand, how much light you need to come out of the product. Most of the ones found in the market are universal, meaning, there will be no need for you to shop for a vehicle specific application, although, that also means that, not all will work well on your tailgate. Below are what I consider to be some of the top trucks led tailgate light bar to consider buying. 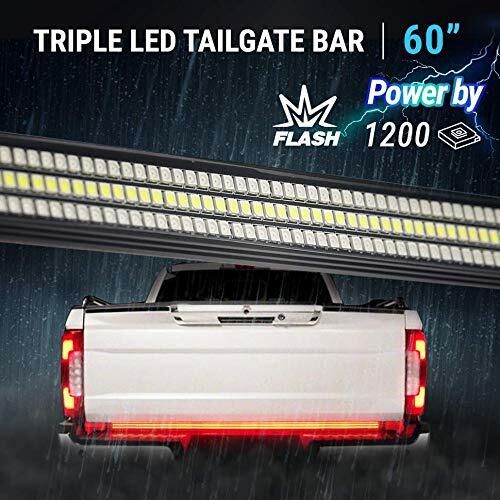 I thought this might be one of the best light bars for the tailgate on the market due to its features, durability, cost-effectiveness, and brightness. Apart from improving your safety, it enhances your truck’s appearance. The lights might just sync well with your factory lights and it lights very brightly. It has tri-core light alpha LED lights which are vivid and potent, and thus, allow you to be seen by another road user during the day and night drive. They are constructed to function for at least 30000 hours, enduring snow, heavy rains, and other harsh weather. There is an IP67 silicone which combines with an aluminum body and at the same time, highly protective as regard to LEDs. They are capable of functioning in cold weather conditions of up to -20 Fahrenheit degrees. Its installation is very simple as you will just have to use the tape (preferably industrial 3M), then place it to whatever spot you want to install the light bar and wire it to the system. There is no bolting, drilling because all you have to use is the tape. After you are done by connecting the wires, plug it in the 4 pin connector and enjoy the display. When you use these lights, as you turn the signal, both sides will be able to flash. If you want to turn right and turn the signal, the left side will be flushed too but dim. Though it doesn’t cause a big problem, it might frustrate you a bit. 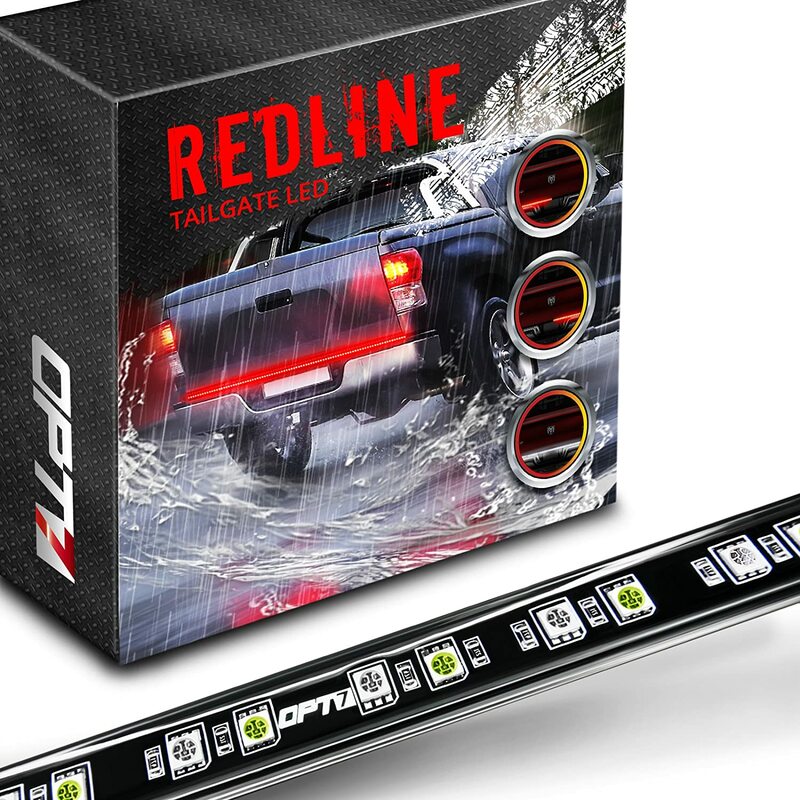 It might be one of the best tailgate light bars with great luminosity and protective features. When you install it, you will be able to keep other tailgaters away from your bumper since it produces a lot of light which is very bright. At times, it will appear to outshine your other ordinary tailgate lights. If you buy them, they are designed for all type of weather. If you stay in a cold or warm area, the light bar will take on little to no wear for a very long time. You can place it on the rear or front if you want to use them as a running light for a little decoration. It is designed to run for at least 100,000 hours, meaning, the lights might be on your vehicle for a very long time. Check to ensure that they are compatible with your specific vehicle before you purchase them. If you purchase, you should be ready to run into problems, especially with the reverse lights. Even after doing a proper installation, the LED sometimes has delayed signal or failing completely to light up. If that happens, it might be due to wiring and I would suggest that you try purchasing a connector and adapter. This will enable all the wires to be hidden and free from exposure to elements. And while it is good to use it in rainy weather, there is a possibility that, you will notice moisture in most of the lights. This LED offers some unique features whereby, you can select the turning color to either red or amber. The red can also function as turning and braking color while during reverse driving, white is utilized. It might be among the most potent bars which are durable and bright. Its brightness is attractive and impressive with a relatively easy installation as you will just need to paste the bar on a 3M tape, no drilling is required. It has an aluminum frame which is protective and stable. It is resistant to harsh weather, waterproof, and it can be able to endure up to 20 Fahrenheit degrees. You can use the hardwire or the four pin connector to wire it to your vehicle’s electrical system. It has a 50000 hour lifetime. To make you to stand out from the rest while on the road, it has a mustang style sequential turning system. But apart from the appearance, the Triple LED lights on your truck will be noticeable both day and night and thus, helping you to avoid a collision. It uses 788 tiny LEDs which are merged into a LED bar that is very powerful. Though it uses a 4 pin connector, it is supposed to be using a 7pin due to the fact that, when you pair it with your factory lights, it produces a delayed light between the two. If you like it, ensure that you pick the right size and brake/signal color. It is a side bed light strip bar weatherproof that doesn’t require any drilling. It has brake lights, left signal, right signal, a lighting color, and white reverse lights. It has red for parking, turn signal and brake. Each strip of lights on this light bar has bright LEDs which will make your truck to be noticed when signaling or braking. It is easy to install as all you will need is to press and hold this heavy duty 25lbs adhesive to keep it in place. No drills are required. The breezing wire easy plug and play installation with a 4 pin flat connector. The LED strips are well protected against raindrops, dirt, snow, and sand, flexible and super durable, with a lifespan of up to 20,000 hrs. It is constructed from high-quality PVC material, IP65 which is waterproof. Expect it to continue working even when it rains heavily or snows as it withstands the washed and weather. It has a fuse overload protection and epoxy process which is designed to refuse moisture for a very long time. If you are looking for a light bar for your truck with 48 inches or 60 inches, then this might just work for you. The 60 inches one is compatible with trucks which are massive such as Dodge Ram, Chevy GMC, SUVs, and RVs. The 48 inches works well with Fords 150, 250, 350, and Chevy Silverado. The two differ in price, size, and in the number of lights with the 48 inches having 48 red LEDs and 24 white LEDs while the 60 inches features 60 red LEDs and 30 white LEDs. But in terms of design, durability, and function, they are all the same. They are very bright and thus, will be able to help you to see the road and assist others to be able to view you while you are on the road regardless of the weather condition of the moment. The strip is made of an elastic and robust material which are resistant to shocks, oxidation, and water. The strips are filled with IP67 silicone which helps in sealing any gap that might be within the strip and at the same time, making the bar to be resistant to harsh weather. You will have two options when it comes to installation; you can use the bolts and screws for a more secure installation or 3M adhesive tape which you will peel and paste on the truck. If you are out there looking for a super bright tailgate light bar, then this light bar might be the one to go for. I bought it for my truck and am not regretting my decision. It offers Lumens output, which is 400 more bright as compared to other light bar for the tail gate. It can work as a turn signal, running light, reverse light and even as a hazard light with all the red LEDs flashing. It comes with a silicon housing which is flexibly sealed to offer optimal protection and has an IP67 waterproof with short circuit inline fuseprotection. The manufacturer has indicated that it works for over 50,000 hours and if that is the case, then it means that it is going to give me a long service. For easy installation, I used industrial 3M tape together with a four pin connector. In the package, you will get mounting hardware to use if you want to have a more secure installation. It doesn’t matter your truck brand as it is a universal light bar for the tailgate, able to fit most models and makes. The manufacturer backs it with a two-year warranty. I consider it to be one of the best due to the fact that, it has several features. It is an all in one light bar that will provide your rear with a conversation piece. It utilizes high powered COB LEDs which produces amber, red, and white lights. The housing is polycarbonate tinted and at the same time, it is fully sealed and encapsulated to ensure that the elements are kept out. 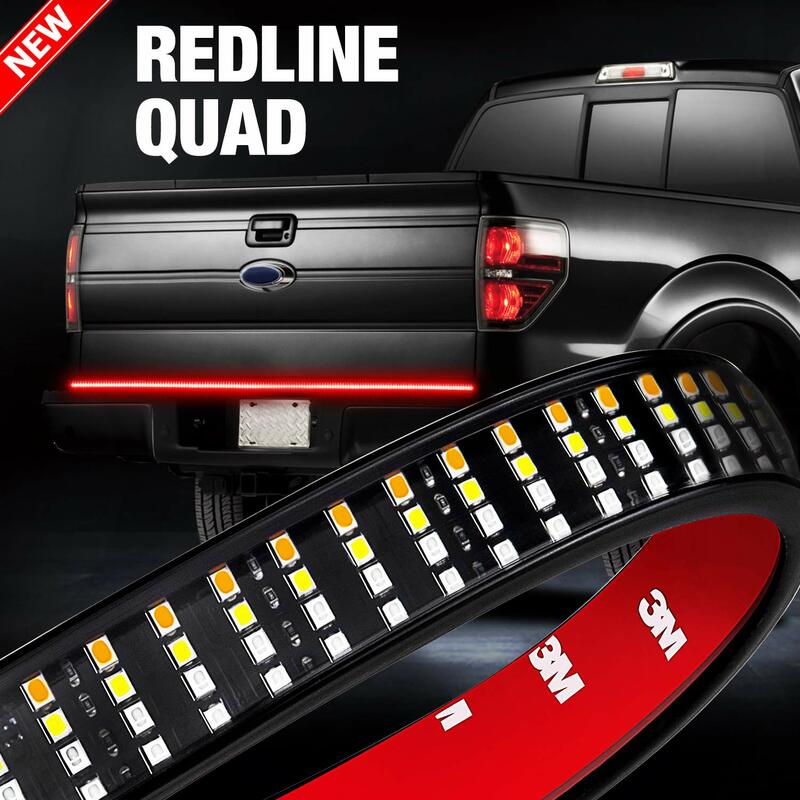 Being able to work directly with your brake lights, running lights, reverse lights, and turn signals, it is hard to go wrong with this particular light bar. It is easy to install it as it comes with all the installation hardware which includes; four prong wiring harness that you will be able to use to hook it to your receiver hitch directly; patented attachment clips for easy removal in order to be able to access your spare tire release if the need arises. 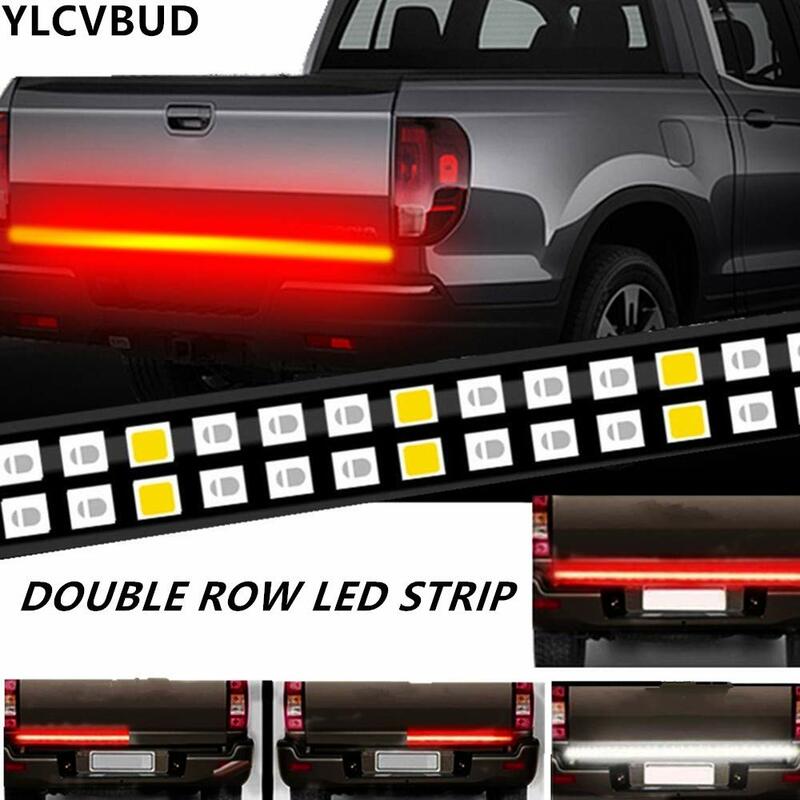 It has three rows instead of one though it resembles a single row LED light bar for the tailgate. If you decide to get it, then it might just perfectly fit well on the sport as well as ordinary trucks. Every signal on this particular tailgate light bar is set at a different brightness. If you feel that, turning signal is very important to you will easily be able to see as it is colored brightly with an amber color. During installation, the mounting brackets might be troublesome and can be annoying. You will find included in the package, washers which you will need to place carefully through the nuts, which is an alignment which is not easy. The nuts cannot be removed from the bar as they come built in. And though even though the lights are bright, you don’t expect them to be as bright as the others light bars on my list like the OPT7. It is common for peeling off of the housing to happen in environments which are prone to receiving humid or inclement weather. While it is not a temporal light fixture, you might require a replacement sooner than you expect unless you take care of your vehicle, and avoid parking it outside when not in use. Tailgate lights have two roles; aesthetic and functional. If you install the tailgate light bar in the rear of your vehicle, between the tailgate and the bumper, will make your car visible. And that is why most of the producers come up with items which are resistant to harsh weather conditions and water. This is because, heavy snow or rain decreases the visibility on the road, making it easy for some to hit into your rear. When you install the tailgate light bar, it will make you be more visible even when the weather conditions are harsh. It needs to be protective and sturdy to be able to resist dirt, salt, and sand. 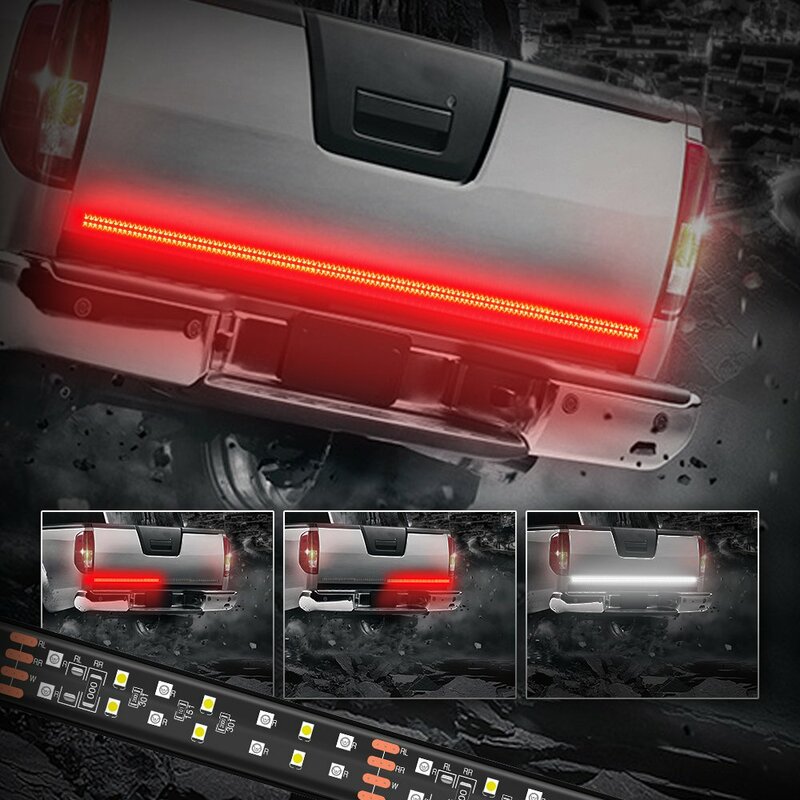 Unlike the rock lights which enables you to see the road behind and in front of you, the light bar tailgate allows others to be able to see you. Most light bars are highly responsive and functional and can easily work with factory lights. Depending on your drive mode, it will shine a different light. As you go through the review section, you will learn that most of the tailgate light bars have a lot of similarities and picking one among them might be hard. LED tailgate lights are made to be used on various types of vehicles. Before you settle on one, it is best if you considered the following tips to help you in finding the light bar that will be best for your vehicle. Light bars for trucks comes in rows of either 1- 3 with most of the bar itself being covered in LED lights. They are flexible, operating in a similar way with the difference lies in the way the brightness is generated. One Row: This particular tailgate light bar type has a set of white and red lights which are set in parallel, to the next fixture. Some manufacturers include amber colored lights, but they remain in the same row with the other lights. There will be more space between the dark area and the amber lights when the lights are displayed to separate them. If the lights become bright, then you will not be able to notice this arrangement. If you are looking for something which is glowing at a rate that appears to be straight as you go down the bumper, then you should consider buying the three rows as it is capable of achieving this. Two Rows: They have a dual row set up with some manufacturers making one row for white lights or reverse lights only. Others decide to designate a row for turning signals so that, you turn your signals to flash in an amber color as you pay attention to the hue which is displayed on photoproduct. If you happen to see a strip row, which is in line with this particular color, then it has to be included. Most of the time, the amber lights are used for turn signals. Two rows are a step higher than the one row and thus, can alternatively be used for a simple decorative display if you desire it. Three Rows: For tailgate light bars, three rows are the most popular as they produce a triple brightness of single rows and at the same time, match up the brightness with that of your factory rear view tailgate bar light. Most of the models have no size issues, especially with the average truck. The three rows can be a combination of one or three colors. If you have a large truck or happen to live in an area which receives heavy snow or dense fog, during the winter months, then you should go for three rows. Though it is simple, it is one of the most important things to consider. You will need to consider your tailgate size and try to match it with the light bar. You will get light bars in the sizes of 48, 49 to 70 inches. In case you buy the wrong size, it doesn’t mean that you will be unable to use the product, but it will just be too awkward to use a light bar that is too long or too short. You will also have to think about the installation and wiring. This might not be an issue because most tailgate light bars get moving with time. But it is important to remember that, not all light bars are able to fit onto all vehicles. While the 70 inches long light bar are rare, but they do exist with most of the LEDs top at mostly 60 inches. It is important that you measure the edge of your truck bed before you go out to buy the light just to ensure that, you get the right size. 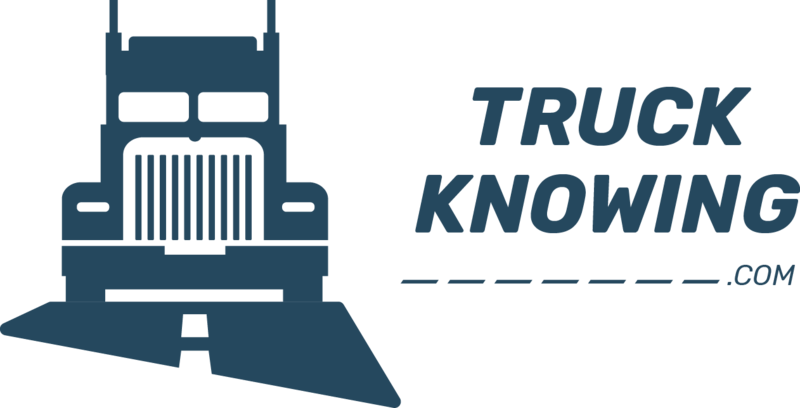 You can go through the specifications of your truck to get the manufacturer’s specifications. If you find out that, it is more than 60 inches on the inside then it means that you will not have problems during installation. If you are not sure, then I would advise you use a tape measure to get the truck’s rear measurements, with more attention being paid to that gap between the liftgate and the bumper. Most of the trucks, this is the place where you place the tailgate light bar. If it is under 60 inches, then you are good. Though it appears that installing a light bar for tailgate might be tough, it is not. You will have to install the tailgate lights just the same way the towing equipment is hooked to your vehicle. All light bars are sold together with a four pin connect which you will use to attach to the towing equipment. Each plug has its own slot where it is supposed to go inside. If you are not sure of where it is supposed to attach, you will need to refer to the instruction manual. As you plug in, you will notice that the wires of the connectors protrude outside to enable you to attach. If you don’t like what you are seeing and you want to change it, then you will have to look for a splitter which will help you in fastening everything from behind the bumper. Once you get hold of the product which is compatible with your tailgate, you will have to check it out and find if the price is worth its value especially as far as durability is concerned. There are several things which affect the rate and thus, it doesn’t automatically follow that, the high price is quality. There are so many things which affect the durability of a product. The LED’s protective frames/tubes provide the housing durability. The bar, which includes the whole system of LEDs, tubing, frame, and wires, need to be airtight in order to prevent condensation, weatherproof in order to endure extremely hot or cold weather, waterproof in order to prevent rust and oxidation and thus, it will be able to endure salt, mud, dust and other impurities. Under durability, longevity is also another thing to consider. Most of the manufacturers offer 30000 or 50000 hours, but they are measures which are taken in optimal conditions without harsh environment and excessive use. Ensure that the light you are about to buy is going to fit your vehicle which refers to the aesthetic and not the compatibility, meaning after you install the light bar, is it going to improve the overall appearance of your truck or not. Even though the function is more than the appeal, but you need not to neglect the appeal too. Consider the build of the specific lights as well as the number of lights. When looking at the design, you will need to consider optionality and functionality. Consider what lights you would like to install, the colors you would like, and if your priority is brightness, then it might just be the light bar you are looking for. The installation process should be considered under design, the easier it becomes to install, the better. You will need to know your budget and ensure that you are shopping within it. I would suggest that, if you want to experiment with tailgate light bars and see if you would love them, then start with the cheaper ones. Think also about the installation process and how difficult it might be. Consider the voltage especially if your truck is already overloaded. When you decide that you need a light bar on your tailgate, I am sure you will find your pick from my top 9 which I have reviewed. Whichever you choose that works for you from my list, rest assured that, you will definitely get value for money in your tailgate light bar which will make your truck unique as you drive on the road The sizes are great for most of the tows and trucks. Check out careful in the value section and understand what you need to look for especially the size and craftsmanship which are the two most important fixtures to look for in all light bars.